This is pretty disappointing to write. I think our guys came out ready to play. Even with the numerous drops from wide receivers, we led at the half. Memphis made halftime adjustments once again, and we didn’t, and they routed us. In two losses to Memphis, Major Applewhite’s teams have been outscored 77-31 in the 2nd half. UH had the lead at the half in both games. How do you explain that? 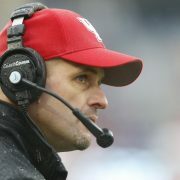 With the loss, Applewhite falls to 3-6 in games in November and December. The 3 wins: ECU, Navy, and Tulane. When the season is on the line, Applewhite has struggled to win games. – 44.0 ppg in our 5 worst defensive performances. We have held Tulane to just 38 points in 2 games (but we lost one of them). The 2018 team has given up 413 points, the 5th-most in school history. However, two of those teams played 13 or 14 games (14 games & 421 points in 2009 and 13 games & 468 points in 2003). If we give up 20 in the bowl game, this will be the 2nd-most points ever given up. If we allow 55 points in the bowl, it will be the most-ever. UH has given up 40 or more four times this season. Since the end of the Dana Dimel era, that’s happened only twice (2009, 2012). We’ve given up 40+ 6 times in 25 games under Major – that ties Tony Levine but is behind Dana Dimel (gave up 40+ eight times in first 25) and Art Briles (9 times of 40+ in first 25 games). Obviously, our situation and expectations have improved since those days. After the opening touchdown, UH ran 34 more plays in the 1st half. Patrick Carr had 1 carry in that span. I’m baffled how we could go that long without feeding him. As the 2nd half started, Carr ran for 19 yards on the first two plays. Instead of feeding him on 2nd and 1, we opt to throw. On 3rd & 1, Memphis stacks the box and we run him right at it and lose 2 yards. UH was 2 of 10 in 3rd down conversions in the 2nd half vs. Memphis. Both conversions were on rushes. Clayton Tune was 18/43 in the game but also had 5 sacks. In reality, he was 18/48 when dropping back – just a 37.5% success rate. Two more passes went for 1 or 0 yards. So 32 of 48 drop backs had a net-negative result. 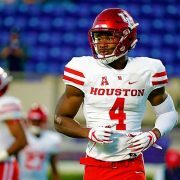 The Coogs went 3-and-out 6 times in the game (and went 4-and-out twice). In those 8 drives, Tune dropped back 15 times in 26 plays (he also ran on RPO plays twice for -2 yards). In the first half, there were four 3&Os and Tune dropped back on 9 of those 12 plays. He was 1/8 passing on those drives and just 2/12 passing in the eight 3- or 4-and-out drives for the game. The OL was really exposed in this game. They’ve been trending downward for the last month but yesterday was their worst game of the season. Part of that is not having D’Eriq King to mask the poor play. The Memphis pass attack won the line of scrimmage all afternoon. Ten TFL and 3 hurries shows by itself that our desire to just drop back all game wasn’t going well. This is another example of Kendal Briles’ inability to adapt in-game. Why do you keep running the same plan even after it has proven ineffective? And again, where was Patrick Carr? He led all running backs in ypc in 9 of the first 10 FBS games (and leads in that stat for the season). He is your hoss. Behind D’Eriq King, he’s the guy you want running the ball. Why is he not a focal point of your offense with a true-freshman getting his first start? I understand we go fast and need to rotate backs at times. But this was mission-critical and we failed to see how the situation changes what you should do. And I don’t want to beat up the defense too much (I did plenty of that yesterday) because they were missing a lot of guys. But Memphis ran for 401 yards against us. 277 of those yards came in the 2nd half on 34 carries. That’s 8.1 ypc while four guys combined to score 5 rushing TDs in the half. From the time Memphis went up 24-21 early in the 3rd quarter, they only had 15 more passing yards. 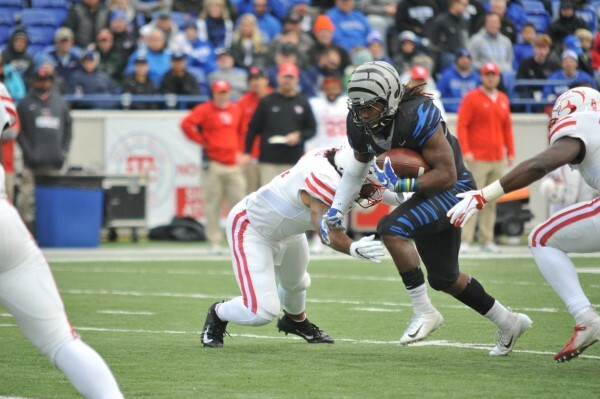 That means Memphis scored their last 28 points on 15 yards throwing the ball. In his last stand as our DC, Mark D’Onofrio couldn’t figure out how to adapt to their ground-and-pound offense. 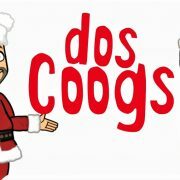 Get 40% OFF A GoCoogs Subscription! 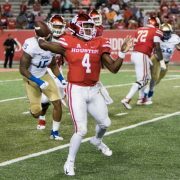 We made this story free today but most GoCoogs.com articles are not. For Black Friday and Cyber Monday, we have a Black Friday Special – 40% off of our regular subscription price. Just $47.99 for one year of GoCoogs Insider access. Click here to sign up for GoCoogs Insider and The Veer message board, the best gathering place for Coogs on the web.